Tell me Lunker, if you don't believe there is a direct correlation between recruiting and NFL production, how do you think these 10 schools would fare on an analysis of their recruiting ranking for the last 15 years? Someone is scratching their head. I showed that UNC does less with “more”. In that same time frame NC State is ranked 14 spots lower in recruiting rankings but nearly have the same identical record. Georgia Tech is several spots higher than NC State with a lot more wins. Alt chalks it up as a “coaching” issue. I chalk it up as inflated rankings. If 247 was so “spot on” with ranking kids and translating to NFL, then why is UNC’s current NFL players combined ranking only a 3 star? I honestly believe UNC losing the in state recruiting battles this year bothered UNV homers and faithful alike more than it bothered them losing on the field. I just cant see why you care . waste of time. Someone has to expose a fraud. Are you taking about the one who corrects you all the time???? LMAO!!!! No you didn't. I said they do less with more. You concocted some grand conspiracy about 'inflated rankings to boost image'. That obviously is false because most of those same highly ranked players ended up in the NFL. They were good before, they were good at UNC, they made it to the league. The only factor not considered is that the coaching sucked and the results wavered. It's as simple as that. Talk about a strawman argument. You combined 15 years of data for an entire conference yet now want to whittle it down to a couple of players, on one team, at one time, all because you've been exposed. You provided the data and the data shows that over a 15 year span for 10+ teams out of 120+, 247's rankings accurately predicts within 10 positions or less that teams rankings on producing NFL talent. For every team, elite or not. If you don't believe there is a statistical significance there then you don't understand how analyze data. I've also asked you to provide the rankings for the top 10 overall teams in the last 15 years and how they compare to that same NFL list. I think me and you both know how it'll end up. Just give up and move on to the next debate. You’ve twisted this so far that you’ve mudded up the arguement. First of all you brought in the NFL. This has nothing to do with the NFL. None of these recruiting services’ mission statements reflect anything about the NFL. Recruiting services rank prospects based on how they project them as college prospects, not an NFL player. “ Shurburtt said the 247Sports.com team does value scholarship offers, as long as they're sure they are committable. UNC will continue to enjoy inflated rankings. You claimed UNC was the benefactor of inflated ratings after a recruit commits. I then found MULTIPLE recruits after they committed to NC State who benefited the same. You had no response other than to do your own 15 year analysis on recruit class rankings in which you also accused 247 of inflating the rankings of a player unknowing that he had even yet to commit to UNC nor was he favored to commit to UNC. What you ultimately accused was that UNC wasn't doing less with more, fans were just simply led to believe they had more because of inflated rankings. That sounded all well and fine except for one little fact, UNC was still pumping out NFL players that mirrored their recruiting classes. So in fact, yes they were doing less with more, 'more' as in still pumping the 28th ranked NFL production. Then came the fact that indeed nearly EVERY school pumps out NFL talent on the same scale that they recruit. That isn't exactly breaking news as it doesn't take a rocket scientist to understand that talent is evaluated based on they are believed to perform at the next level and if you develop based on that growth curve, then you stand a greater chance at being an NFL caliber player. It's no surprise whatsoever that those teams who are at the top of the recruit rankings for the last 15 years are also at the top of NFL production. Nobody ever claimed it was 247's mission statement to project NFL viability, it's simply the impartial barometer that told us your argument about an entire recruiting service being partial to one school, was full of crap! So no, you muddied this up every time one of your little accusations folded like a cheap tent. Wrong. I never poked fun at him regarding scholarship offers. I think that's a great barometer. 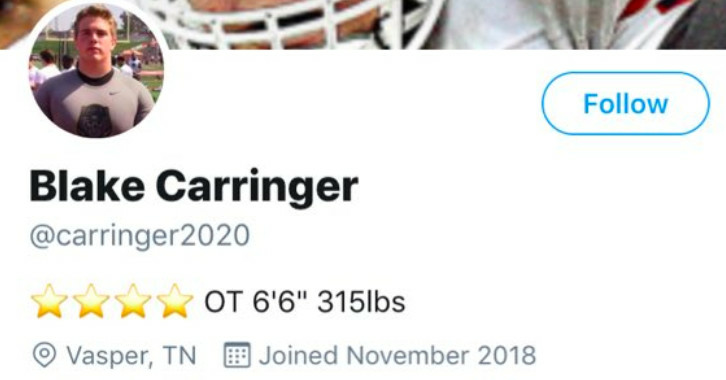 What I poked fun at him about was by insinuating Don Chapman was not a good recruit by evaluating 'player ranking' and then claiming 'he only judged recruits by looking at their offer list. He failed to realize Don Chapman had an offer list that included LSU, USC, Oregon, Washington, etc. If you want to prove that the preseason rankings are inflated, then do a comparison to the preseason rankings versus the final rankings. You will see a clear pattern of inflation. Thinking fast Thinking Slow needs to be required reading for this group of posters. A basic understanding of bias would really be of value. Josh Downs commits to UNC. ^ his daddy played for state? wth is wrong with him going to the enemy? I can't wait to hear the ranking bias on this one. State fans believed there was no way he'd go anywhere else. Pack Pride gets pumped full of sunshine and when it blows up, they blame 247 for UNC bias, bag men, blah, blah, blah. And Bly is his uncle. Because Michael Clark says so? So is he going to turn his back on uncle Dre? Yeah, these recruiting services are LEGIT! Idiots ranked a fake player a 3 star. 247Sports is altering how the Composite rankings work after Rivals apparently rated a spoof. What's funny is the CEO of 24/7 called Rivals the "little brother"...what professionalism by him. Clown. Unc fans call State that all the time, but its unc fans we're talking about. No one accuses them with professionalism. Glad to see you back BBD. My suggestion is that when state fans stop acting like little brothers , unc fan's tag of them being little brothers will lose it's impact. Gotta lose that conspiracy" unc is out to harm us " play. It is so little brotherish. Unc fans opinion has zero impact on me personally. I just find it comical. But wouldn't that work both ways? When unc fans stop acting like elitists and their crap doesn't stink, and they're above you then State fans wouldn't continue ridiculing them? 247 did not rank him. They have a composite system that automatically pulls every recruit from other sites and gives them an average of all sites so you can see them side by side. That's that you saw and if you look again, you'll see that 247 never evaluated nor ranked him. As for the 247 CEO, he founded Rivals and then sold it to Yahoo. Surely you knew both of these. 247 just released an article measuring the success of their rankings. Guess what parameter they used? Yep, you guessed it, how their recruits fared in the NFL. I didn't care enough to click, but surely they didn't use 20! "Random" people to rate themselves. I really hope there's more to it than that! The NFL MVP was a 3 star.